For HTTP and HTTPS protocols, use localhost or 127.0.0.1 as the proxy host. The default port for the recorder is 8090 (HTTP and HTTPS), but it may be changed in Preferences. To change the proxy settings in Internet Explorer, click Tools > Internet options, and choose the Connections tab. If you connect to the server through a local network, go to the Local Area Network (LAN) settings section and click the LAN settings button. 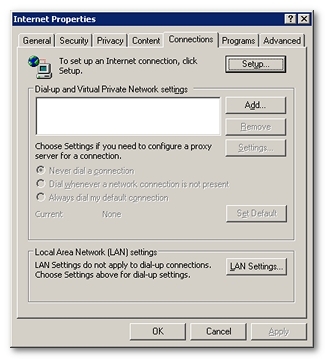 If you connect through a modem, go to the Dial-up and Virtual Private Network Settings section and click the Settings button. For other browsers, the proxy settings are accessible through the browser preferences. Test the set-up by entering the URL http://www.neotys.com/recorder.html?lang=en&port=8090. If the page displays correctly, the settings are correct (this URL is not recorded).